Our colleagues from across borders have made a visit to our BMMI Sitra HQ! Ten employees from our overseas Finance and Logistics departments attended an intensive training on the Vision 2000 application, which is a comprehensive financial accounting and management information system. The weeklong training aimed to make key employees familiar with the finance and logistics modules of the application. Those who attended included BMMI Djibouti’s Inventory Controller, Vipin Sagar, and Finance Manager, Amina Souleiman. From GSS Sudan, Accountant, Muzammil Baig, Inventory Manager, Michael Lawrance, Purchase Supervisor, Mona Saeed, and Accountant, Sahar Osman, were in attendance. Accountant, Eugene Webala, from GSS South Sudan, also took part, along with BMMI Iraq’s Finance Manager, Mohammad Ramzan. CS&S Finance Manager, Mohammad Jamsheed Luchman, also took part, along with GSS Ghana’s Finance Manager, Joseph Aggrey. 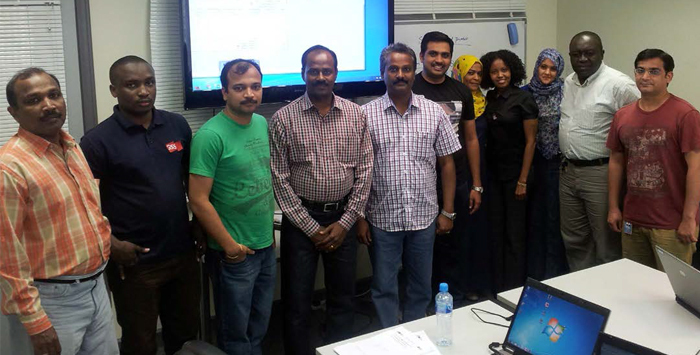 System Development Manager, Edmond Fernando, HR & Payroll Specialist, Biju Sebastian, and Senior Developer for Oracle Application, Jeyaseelan Soosai, led the training session for the ten participants. Although the Vision application has already been implemented in some of our operations overseas, many new employees have joined the company and a refresher course had not been carried out since. While they were visiting our Bahrain offices, they also took part in an HR and Finance induction, where they were able to ask questions and clarify many of the queries they may have had. Moreover, they received an introduction to SharePoint, in order to transfer the knowledge to their colleagues overseas, acting as our SharePoint champions. It was great to see you all in Bahrain and we hope you enjoyed your visit! Until next time our friends!